And I'm bringing you a large collection of customized instructional/decorative signs for use in the world! Sick of the boring default sign texture? 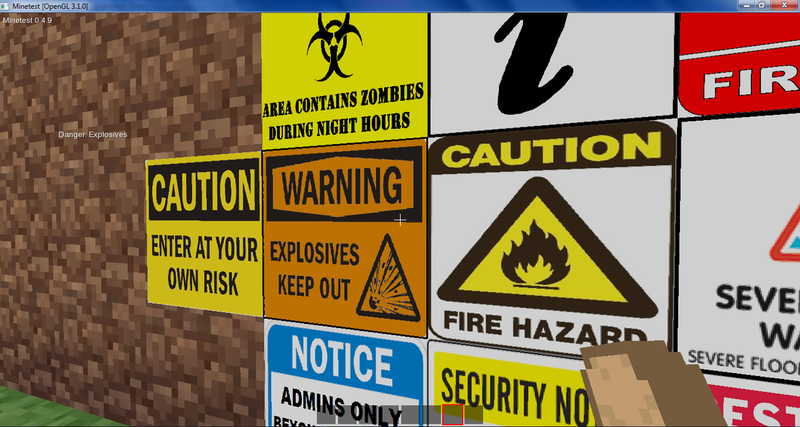 Tired of the minecraft-style sign that only displays text? These signs each display a fairly high-quality image of a real sign (see screenshot below), and are quite easy to read at a distance. Additionally, each one displays a short string of text that describes/repeats what the sign says when you "point" at it. I have not yet created any crafting recipes, as it is somewhat difficult to create a unique recipe for each sign. Any suggestions for recipes would be greatly appreciated. 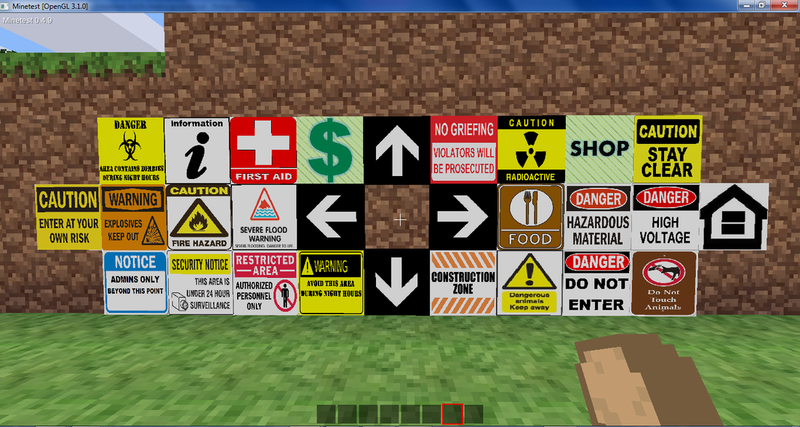 I will likely add more signs in the future, so check back for updates! Last edited by Ackirb on Fri May 09, 2014 13:38, edited 1 time in total. Ackirb is the name, Anti-Griefing mods are my game. But that's okay, there are a lot of mods that are the same but at the same time still are different (ores, tools, blocks, light/glass). That said, your signs are new, decorative and they really look great. (I would have liked to give links of those too, but I'm apparantly not that good with the search funtion of this forum. It seems the easiest way finding them is browsing through the mod releases and maybe modding general topics). Hey, thanks for the heads-up. I'll re-think the name of this mod. I have actually seen some of these other similar sign mods (although not Dan's). And while they do provide some great ideas, they didn't have the variety nor the customization that I was looking for. --[[ Customized warning / instructional signs for the world. The mod has been removed from Dropbox. I would suggest marking this topic accordingly, if possible. Last edited by Samson1 on Tue Nov 06, 2018 15:57, edited 1 time in total. Nice mod, can you please upload your latest release on forum too (for file mirroring)?